Holy Moly! 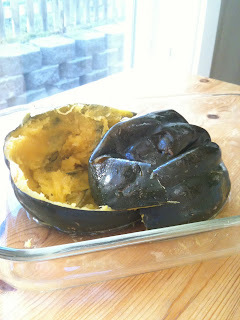 I chowed this delicious acorn squash in, uh…., under a minute. More like 20 seconds, seriously. I had this amazingly tasty veggie all to myself. The kids were at school, and my hubby is on a mini vacay! Glad they weren’t here to witness my slurping and totally awful manners! This super veggie is loaded with bazillion amounts of Vitamin A which is super awesome for your skin. Today, I cooked it in the oven at 400 with about a cup of water in the dish. After 30 min, it was soft and ready to be inhaled. Before the feast, I doused it with 2 teaspoons of brown sugar. In the past, I have added butter and some maple syrup. Today, I skipped out on that stuff. It would have taken too much time to get all that out, and I was starving. So now these scraps will be on their way to the wiggler bins. Just giving them a tidbit, a little teaser because in the next few weeks, they will be enjoying huge amounts of pumpkins and gords!